As part of our National Dance Week celebrations this year, Dance Nova Scotia has chosen someone from our provincial dance community to be our International Dance Day Ambassador and deliver a message for International Dance Day (IDD) 2019, which takes place on April 29th, the last day of National Dance Week. 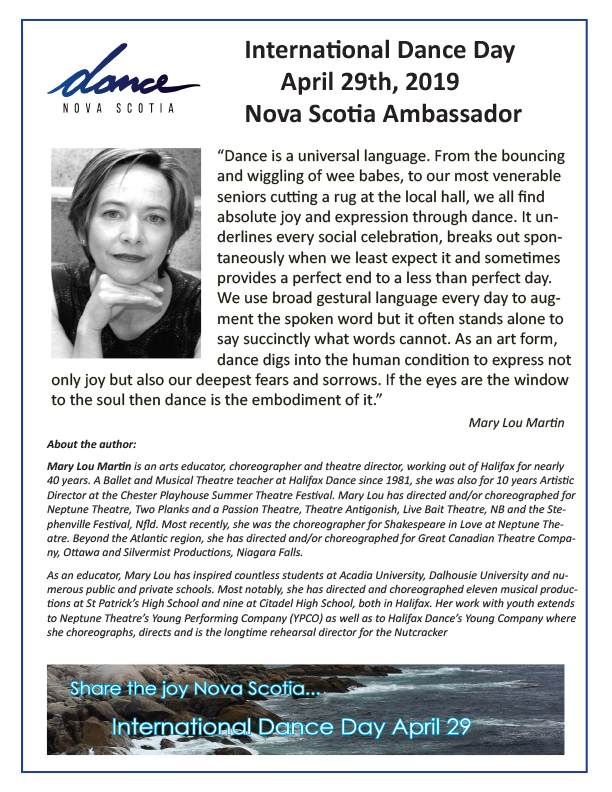 Nova Scotia dance teacher, choreographer, theatre director Mary Lou Martin is our first NS IDD Ambassador. Her message is an affirmation that dance is a part of every life. Please read it and share it with everyone. Canada's National Dance Week, built around UNESCO's International Dance Day, will be taking place this year from April 22nd until the 29th. During this week communities across the country will be participating in an array of dance-related events promoting not only the importance of creative expression but also the strengthening of community bonds. As shown in a recent New England Journal of Medicine study, dance, more than any other physical activity, contributes largely to brain health and function as well as physical wellness. It also provides a host of other benefits to the individual and community such as social cohesion, creative economy and empowerment of youth. Dance week presents the opportunity to celebrate the many ways in which dance contributes to human existence and reminds us of the significant role it plays within our history and culture.